Whiteface is a town in Cochran County, Texas, United States. The population was 449 at the 2010 census. According to the Handbook of Texas, "The name of the town came from rancher C. C. Slaughter's Whiteface Camp and Whiteface Pasture, which were named in turn for the cattle on his ranch." By 1924, Slaughter's son-in-law, Ira P. DeLoache, turned the ranch into the new community of Whiteface. The community was moved several miles the next year to be at the railroad. Oil was discovered near the town in 1937. It was incorporated in 1945. Whiteface is located on the high plains of the Llano Estacado at 33°36′00″N 102°36′50″W﻿ / ﻿33.60000°N 102.61389°W﻿ / 33.60000; -102.61389 (33.6000974, -102.6138084). According to the United States Census Bureau, the town has a total area of 0.58 square miles (1.5 km2), all of it land. Whiteface is located on State Highway 114 44 miles (71 km) west of Lubbock and 12 miles (19 km) southeast of Morton, the Cochran County seat. As of the census of 2000, there were 465 people, 163 households, and 125 families residing in the town. The population density was 799.8 people per square mile (309.5/km²). There were 207 housing units at an average density of 356.0 per square mile (137.8/km²). The racial makeup of the town was 67.53% White, 2.80% African American, 2.58% Native American, 26.45% from other races, and 0.65% from two or more races. Hispanic or Latino of any race were 45.16% of the population. There were 163 households out of which 47.2% had children under the age of 18 living with them, 59.5% were married couples living together, 10.4% had a female householder with no husband present, and 23.3% were non-families. 22.1% of all households were made up of individuals and 10.4% had someone living alone who was 65 years of age or older. The average household size was 2.85 and the average family size was 3.37. In the town, the population was spread out with 35.1% under the age of 18, 6.7% from 18 to 24, 31.8% from 25 to 44, 16.3% from 45 to 64, and 10.1% who were 65 years of age or older. The median age was 33 years. For every 100 females, there were 91.4 males. For every 100 females age 18 and over, there were 92.4 males. The median income for a household in the town was $30,833, and the median income for a family was $37,500. Males had a median income of $27,321 versus $17,500 for females. The per capita income for the town was $15,060. About 10.8% of families and 14.4% of the population were below the poverty line, including 20.4% of those under age 18 and 13.7% of those age 65 or over. The city of Whiteface is served by the Whiteface Consolidated Independent School District and home to the Whiteface High School Antelopes. ^ a b c "Whiteface". Geographic Names Information System. United States Geological Survey. 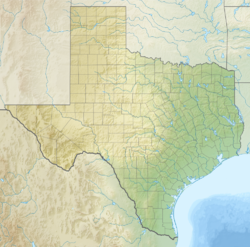 ^ a b "Geographic Identifiers: 2010 Census Summary File 1 (G001): Whiteface town, Texas". U.S. Census Bureau, American Factfinder. Retrieved July 29, 2015. ^ H. Allen Anderson. "Whiteface, TX". Handbook of Texas. Retrieved May 26, 2013. ^ Brown, Steve (November 23, 2012). "Real estate promoter DeLoache was a Dallas legend back in the day". The Dallas Morning News. Retrieved December 12, 2015. This page was last edited on 2 December 2018, at 10:10 (UTC).